Colorful flowers blooming around your yard are probably at least a month off. Spring in Minnesota (especially this year when winter overstayed its welcome) means our landscaping is a little lacking in terms of color. Mud and foliage abound. Browns and greens in the garden might be becoming boring and that is why you’re thinking of a way to add a shot of color and perhaps make your yard stand out a bit more than it does. Adding some outdoor color is something that can make your yard and home stand out more, no matter how big or small your lot is. You’re able to make it pop out of the landscape by just painting items inside it or adding already brightly-colored items. Here are some ways that you can add a bit of color to your yard that are all easy to put together and affordable for any budget. Bright flower pots and large containers placed strategically around your patio, deck, walkways, etc. They provide colorful touches, even before you’re able to add plants to them. Or consider putting out pre-potted spring bulb plants like tulips and daffodils. You can always bring them indoors if a late frost threatens. Arbors and pergolas are a great thing to have over walkways and outdoor rooms; when you paint them a bright color, you’re able to add a bit more into the background and perk up your otherwise drab spring landscape. Art objects such as garden statues, fountains, and bird baths can be just about anything that you find and like. Finding brightly colored ones and placing them throughout the greens and browns in the garden can make certain areas stand out more than others and provides a beautiful focal point in your yard. Walkways and paths, as simple as it sounds can be painted and brought to life with bright colors that allow you to make walking to the garden more pleasant while also allowing people to know where to go in order to see the garden itself. 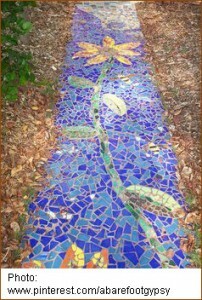 One of the more interesting ideas we’ve seen recently is a colored mosaic walkway like the one in the photo above. Painting fences and walls around your yard in bright colors can provide more of a splash and also surround the area with something that stands out in an otherwise drab yard. If you’re considering adding color to your landscaping plan, make sure to give us a call at Architectural Landscape Design. As Minneapolis-area landscape contractors, we can help you plan and make sure that your yard stands out compared to the rest on the block, even in the drab spring months. We are currently offering a free initial consultation – call today to schedule at (952) 292-7717.